(1 Customer Reviews) | Write Review 6 issues per year Internet Genealogy is your guide to successful genealogical research using the ever-increasing power of the World Wide Web. We also recognize, however, that the Internet isn’t necessarily the be all and end all of your research. Internet Genealogy will also tell you what to do if you cannot find the records you need and how to confirm your findings. 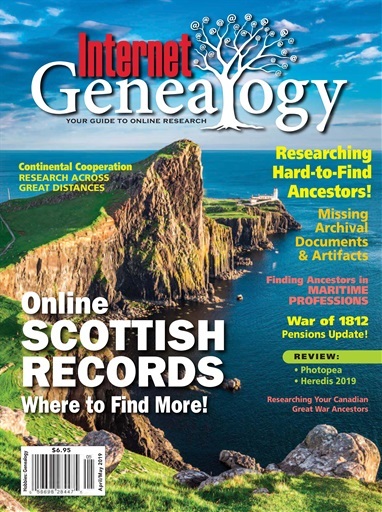 The magazine also covers advanced genealogical methods such as DNA analysis, as well as software and technology reviews, case studies, databases and other Internet-related family history topics. Online Scottish Records: Where to Find More! Internet Genealogy is your guide to successful genealogical research using the ever-increasing power of the World Wide Web. We also recognize, however, that the Internet isn’t necessarily the be all and end all of your research. 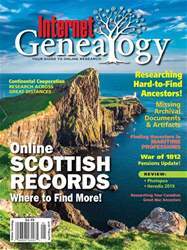 You'll receive 6 issues during a 1 year Internet Genealogy magazine subscription. Good internet Genealogy Mag - full of bright new ideas and information for your research! You'll receive 6 issues during a 1 year Internet Genealogy magazine print subscription.